The wording even goes as far as saying that your ability to use your apprenticeship levy funds or take advantage of the support available for SMEs, will be limited if you are unable to evidence adherence to this commitment. Participants will be expected to regularly undertake university tuition, online learning and assessments. For most programmes, this will equate to a significant proportion of the recorded time. This requirement also sets out that apprentices must combine this with a range of other eligible activities undertaken in the workplace. Employers are given the flexibility to manage the implementation of this requirement in a way that will most benefit their apprentice and organisation. Often, the 20 per cent will include some ‘protected’ time, particularly when approaching assessment deadlines, and time spent on the other eligible work-based activities. We often find that employers are surprised at how quickly these activities add up. While the off-the-job requirement can appear to be a challenging measure to achieve, we are encouraging employers to actively engage with it in order to maximise the impact of an apprentices learning. Giving some protected time to apprentices will give them the breathing room to process their learning and apply it to their own context and practices. 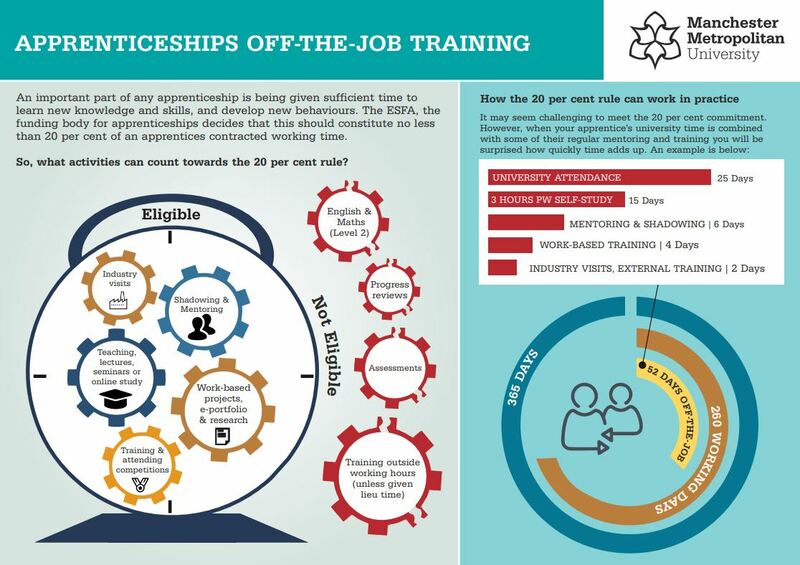 We have produced an infographic to help you understand how you can structure this time for your own apprentices and are happy to provide tailored advice for your own organisation's context. An important part of accounting for the requirements set out in the funding rules, including the one highlighted here, is regularly contributing to an online e-portfolio. The e-portfolio is a flexible tool, accessible on a range of desktop and mobile devices, which allows apprentices to record evidence of skills and behaviours developed in the workplace. These skills and behaviours are carefully mapped to the appropriate Apprenticeship Standard ensuring apprentices are developing in line with government requirements as well as contributing to workplace needs. Regular review meetings with employer-liaison tutors help guide completion of the e-portfolio, as well as university tutors being available to discuss progress as part of review sessions.